Powers/Abilities: McCoyle was formerly a talented boxer. (Iron Man IV#14 (fb) - BTS) - A low-level boxer, Charlie "Cobra" McCoyle, sometimes called the "Topeka Kid", was managed by Tommy Barnes. After taking repeated hits in matches over ten to fifteen years, McCoyle was left barely functioning. Barnes started taking care of him. 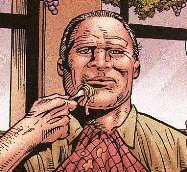 (Iron Man IV#14 (fb)) - McCoyle was fed by Barnes at the Cauliflower Club, where they ate with several others, including Happy Hogan, Pepper Potts, and Rudy. 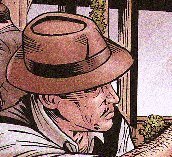 (Iron Man IV#14 - BTS) - Potts remembered McCoyle when Hogan was hospitalized and in a coma, tended to by Dr. Wyatt. Comments: Created by Daniel & Charles Knauf, Patrick Zircher, and Scott Hanna. (Iron Man IV#14 - BTS) - Dr. Wyatt tended to the comatose Happy Hogan, providing advice to his wife Pepper Potts. 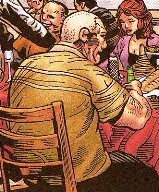 (Iron Man IV#14 (fb)) - Rudy ate at the Cauliflower Club with Happy Hogan, Pepper Potts, Tommy Barnes, Charlie McCoyle, and others.